I’m feeling quite dejected after this event after my own lack of effort during the second half of the race and that’s a key message I want to convey in this report. Despite the fact that I had a number of other issues (which I will touch in the report), these somewhat masked a poor personal effort. So let’s backtrack a bit and start from the beginning. 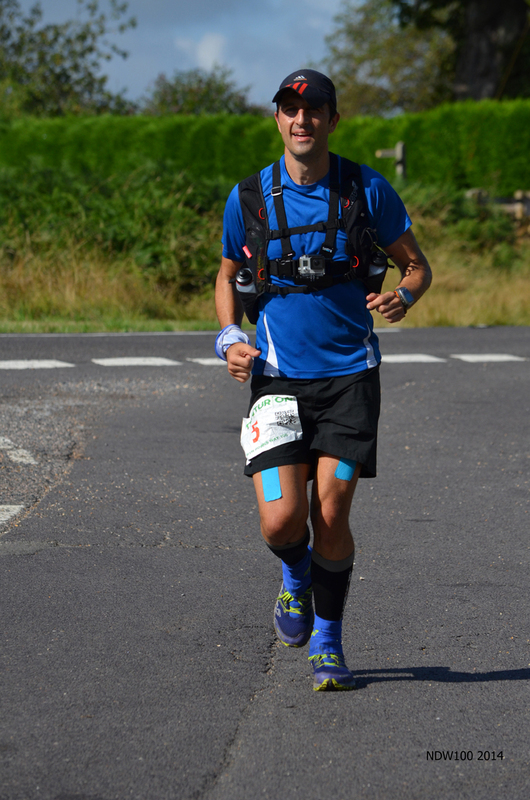 My last event was the South Downs Way 100 which went pretty well having completed both the GUCR and Thames Path 100 before. Since then, I haven’t been able to put in the usual amount of preparation for a 100 miler. There’s nothing to blame here, it’s just one of those periods when other stuff is going on and a combination of having a weekend off after the South Downs 100, taking part in the Endure 24, a family holiday (and an extra half a stone of weight) and work meant that I didn’t do my usual level of preparation and running. A quick look at my training log reveals I did no long runs (over 13 miles) since the SDW100 and hadn’t been putting in good weekly training since April before all the events started. However, I was feeling well rested so was completely accepting of the fact that I wasn’t fit as I could be. It was one of those things and I would just do the best I could on the day. Unfortunately, 10 days before the NDW I pulled my calf muscle and was forced to ”RICE” (Rest Ice Compression Elevation) like a madman in the build up as I went through the usual pain and recovery process from the initial “sniper shot to the leg” and can’t walk through to pain and discomfort and then to the ache in the injured area. I made the typical mistake of testing it out as soon as it felt a little better and had a pretty uncomfortable lunchtime run with Matt Dunn (stop/start/walk) on the Tuesday before the race and spent the afternoon limping around again. I continued with the self-treatment, didn’t run on the Wednesday and then did a couple of stop start run/walks home from work on the Thur/Fri. I was pretty confident that as a worst-case scenario I could hike the NDW within the cut off and keep the Grand Slam goal alive. This meant that ambitions weren’t that high before the race. The calf was healing well it just needed 2-3 more days before any feeling of discomfort fully subsided. It was going to be a little bit of a risk particularly as I couldn’t even do a single leg calf raise without feeling it. A key part of the challenge for the Grand Slam is not just about your ability to cover a 100 mile distance on foot (and deal with the conditions on the day) but also to be fit and injury free for each race during the year. 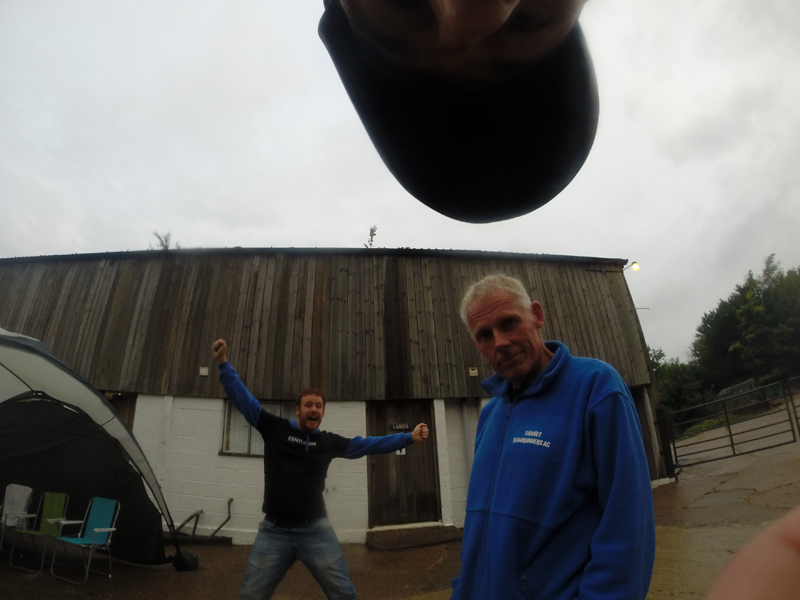 The NDW100 was the race I was hoping to “blag” and just get it done and over with. However, I didn’t want to start the race feeling sorry for myself and when you’re on the start line, you’re on the start line no excuses and I set myself a plan to try and get in under 24hrs. I was up at 3.30am and set off at 4am to collect fellow runner Dave Ayling who was taking part in the event (but was recovering from a long time out and planning to hike from the start). 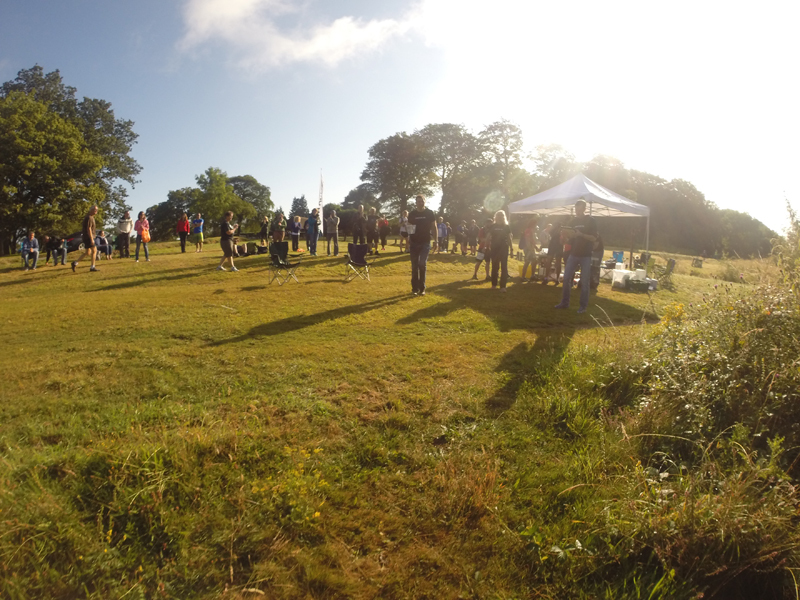 We arrived at Farnham just after 5.15am and I went through the usual efficient kit check and registration process and said hello to a few people before listening to the race briefing before taking the opportunity to use the toilet before the race. Despite not wanting to feel sorry for myself, I mentioned my dodge calf muscle to the first three people I spoke to before the race… idiot. Mind you, they could tell it was serious as I was wearing calf guards. I should add that I was geared up with a GoPro camera and chest strap and had been asked to capture some footage of the race for the event sponsors Eventbrite. The plan was to set the camera to take a picture every 5 seconds and I was armed with plenty of spare batteries and memory cards to capture this footage. Look out for sight of the finished article once it’s all been put together. 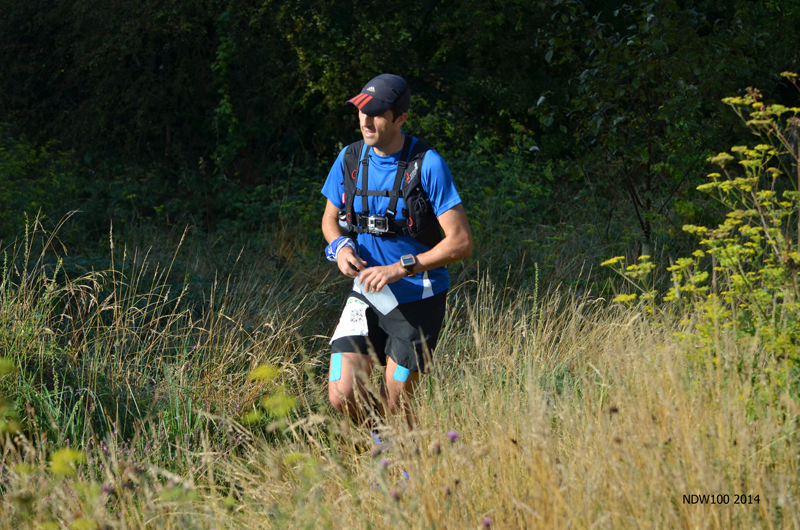 I started off somewhere amongst in the middle of the pack as we headed off from the start position out of Farnham. The first few hundred yards were just spent ‘feeling out’ the calf, I could feel a dull ache with every step but it wasn’t painful or stopping me running and the ache did seem to ease off a little as the muscles in the leg warmed up. I was up and running, a good start! The weather forecast was good for Saturday and not so good for Sunday and it felt pretty warm quite early on. I ran for a little with Fiona McNelis chatted professionally about Ministry of Justice Protocols/Road Traffic Accidents and Personal Injury Claims (damn exciting stuff I know) for a while before I drifted on ahead. 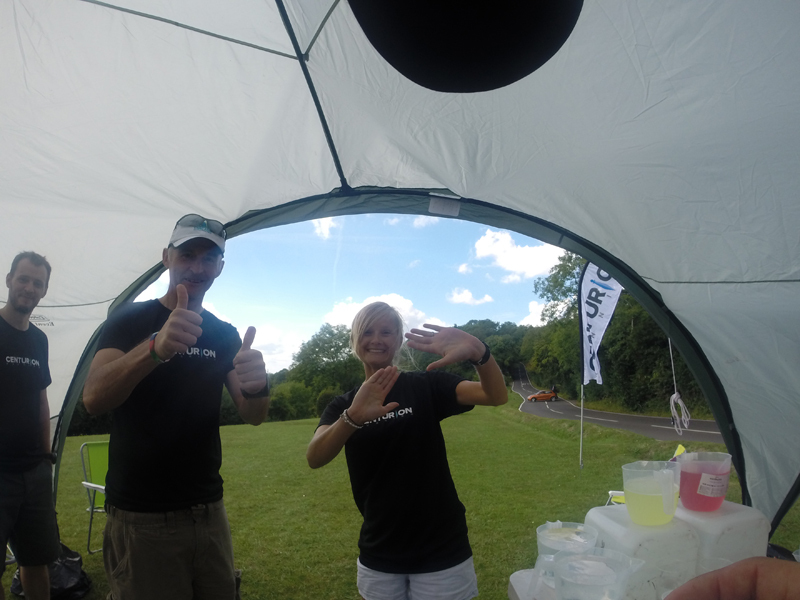 The first Aid Station was at Puttenham approximately 7 miles into the race and I grabbed a few snacks from the table and walked for a little to eat before picking up an easy pace. The North Downs route continued along a number of lanes, pathways and wooded areas which seemed to twist and turn quite a bit, it was all fairly flat at the moment and all very pleasant. The second Aid Station was on top of a short hill at Newlands Corner where there was a small crowd of supporters next to the Aid Station tent. I paused to top up my bottles, grab a handful of snacks and then walked on whilst eating this food before settling back into a run. 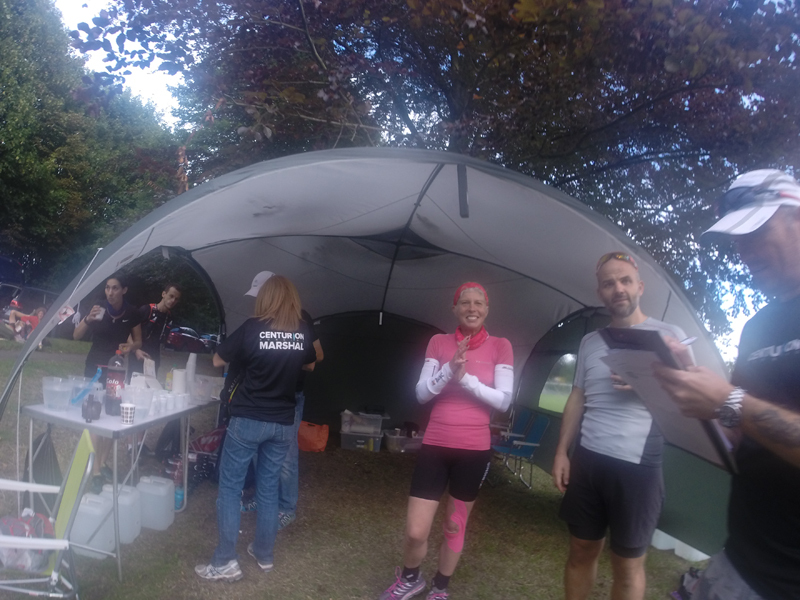 I was running along with fellow club runner Wendy Shaw and a few other guys dotted around for a while and we chatted, ran and enjoyed the route as we headed towards Aid Station 3 and Box Hill. The last time I had encountered Box Hill was during the 2009 Picnic Marathon when I was a real novice to running. It was a tough experience that day going up and down step after steep step and I was looking forward to getting this section over and done with. 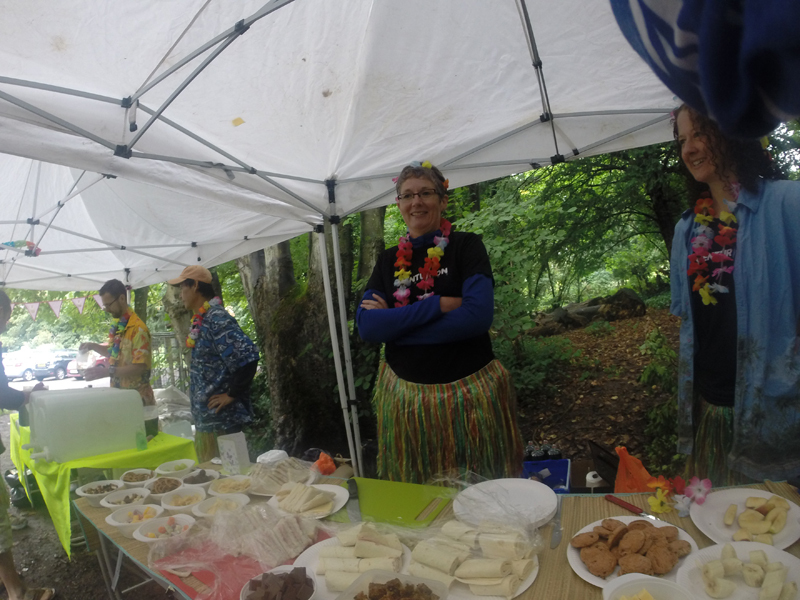 After arriving at a busy road and heading through an underpass we arrived at the Hawaiin themed aid station where I once again topped up my bottles and grabbed some food. I had covered the first 25 miles in just over four hours, the calf was holding up and I was feeling pretty good about the race at that point in time. 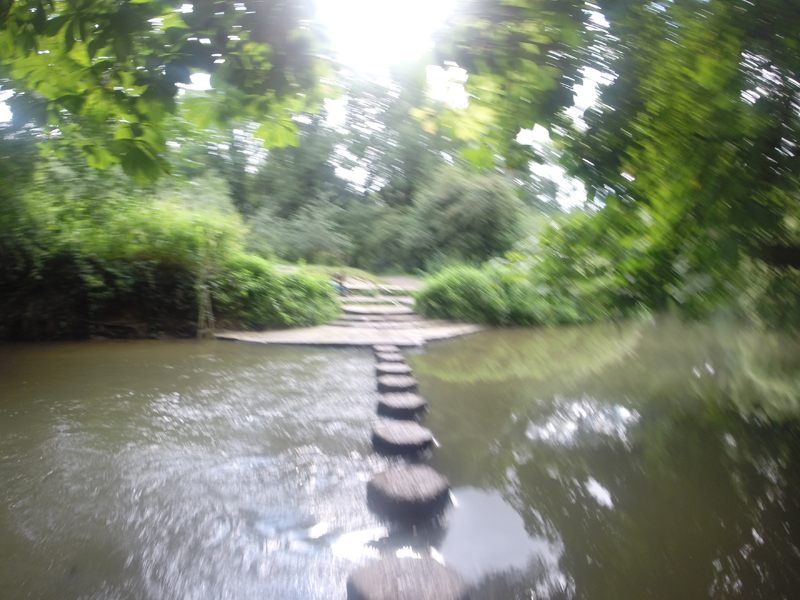 A few hundred yards later and I arrived at the stepping stones at the bottom of Box Hill and spied Stuart March ahead grabbing some pictures and I bounded across the steps before nearly ignoring his high-five (sorry) and then continued on up the steps ahead. 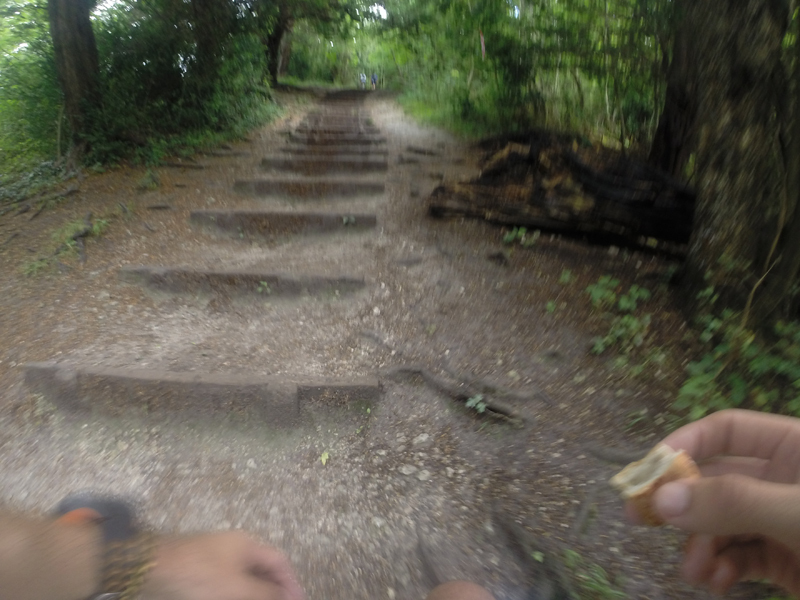 It was fair to say that the steps were no-where near as bad as I remembered as the Picnic Marathon which involces two loops of Box Hill and after a bit of a stagger and push up these it was all over and the path leveled out giving you a lovely view of the surrounding area. However, there was a slight sting in the tail with a long winding steep section not too far afterwards which I found more of a grind than the steps. We carried on along more undulating pathways which my calf could definitely feel both going up and down and headed through some more forested pathways towards Reigate Hill. 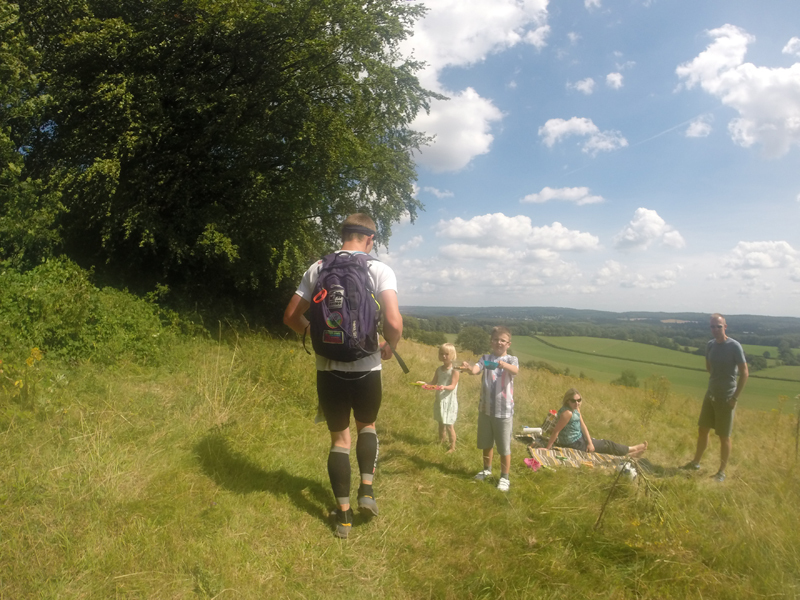 I had to stop around here for a ‘comfort break’ before carrying on towards the next Aid Station at Reigate Hill where the volunteers were on hand to top up my supplies as I drank a couple of cups of coke, grabbed some food and then marched on whilst I ate the food. There were a few people around as runners continuously leap frogged each other. I recall crossing over the M25 near Merstham where the traffic looked busy and running along with Wendy again for a bit before I dropped off and had to take my second ‘comfort break’. I jokingly sent a text message to someone to say I was on for a new ‘Poo B’ today. Hilarious stuff indeed, I just hope that was coming back to bite me in the a… no I won’t go there. 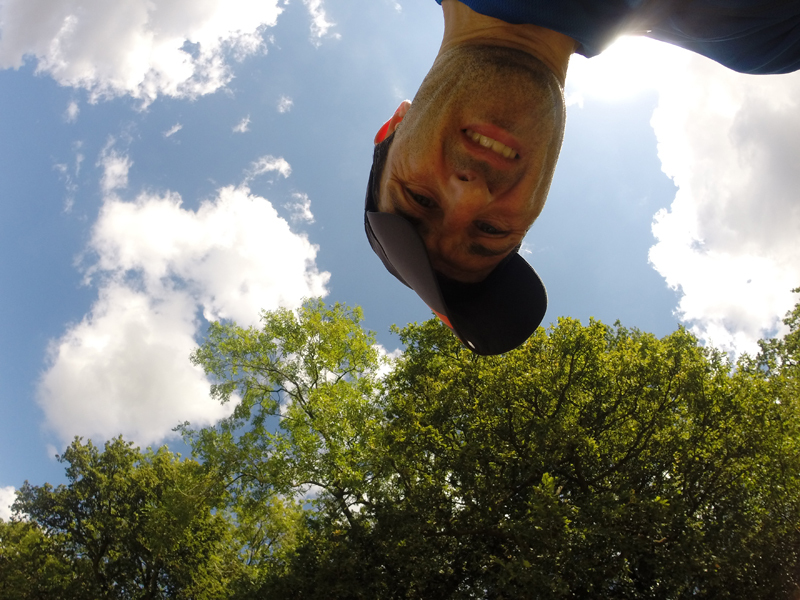 I paused briefly to make another battery change to the GoPro camera. I was getting about 3 hours of battery life at a time and so made the odd short stop to change the batteries from time to time which meant I started drifting back from people I had been running with. I was making steady progress running with the odd walk breaks or hikes up the ‘hillier’ (in reality any gradient) sections. My legs were grumbling a bit and I tried to convince myself that this steady pace was ok. 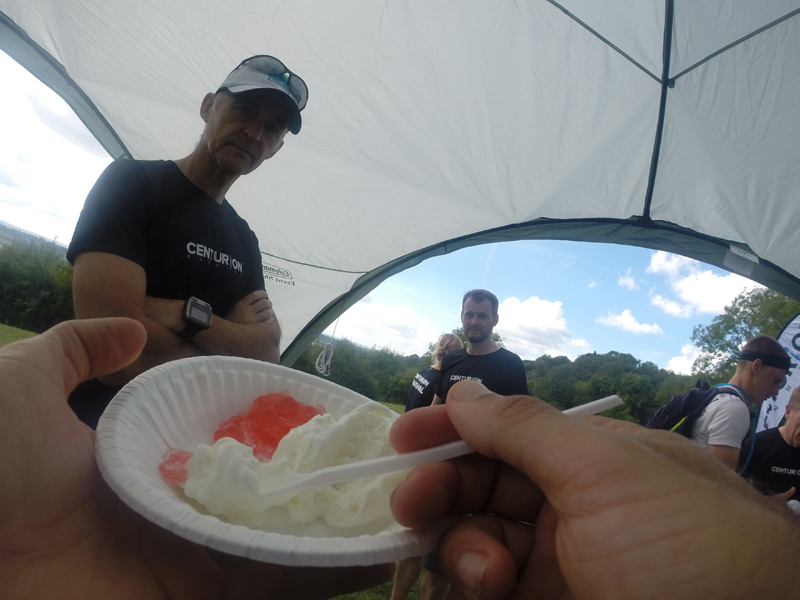 The next Aid Station was the “Ice Cream Dream Team” at Caterham (38 miles) about 7 hours in. I was just thinking that I fancied some ice-cream as it was a pretty warm day and then up popped the Aid Station with Ice-cream, awesome. I had a bowl of ice-cream and jelly before setting off. The next leg was a short 5 miler to Botley Hill and I continued largely by myself now through tree covered track paths to the “Pirate” Aid Station at mile 43. I had a brief chat with the guys there as I ate and resupplied before marching on again. No more than twenty minutes later and I had to stop again for another ‘comfort break’, despite eating what I normally eat my stomach wasn’t feeling too great now and I was experiencing that sinking feeling in the pit of your stomach. I continued on through more shaded paths and across fields where you could feel the warmth of the day. We passed a family with a couple of kids offering some treats which was sweet of them and continued on towards Knockholt Pound. It’s just like taking candy from a kid.. I had a minor navigational issue around the 46 mile point where I followed a NDW marker, passed a bit of red and white tape and then ended up a what appeared to be a dead end. I had the route on my Garmin and could see the direction I needed to follow and corrected my route before bumping into Karl Zeiner who had come from a different direction. I must have missed a marker somewhere but not sure where. Through the gate follow the marker and I’ve missed something somewhere, oops! Karl and I ran into the next Aid Station together once again passing a couple (cheerleader and camera man) who I had seen several times out supporting the runners which was great. The first 50 mile had been covered in about 10 hours which was on plan although the last 10 miles or so had been a bit steadier and with the occurrence of a few unscheduled stops. Getting to the halfway point. Karl Zeiner pictured. I stopped here for some hot food, grabbed my drop bag, collected my head torches and organised my gear for the next part of the race. 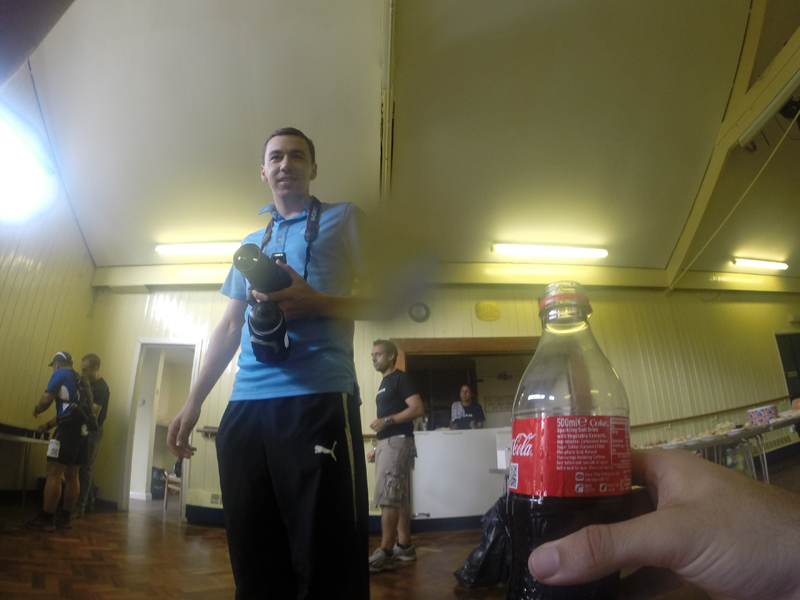 There were toilet facilities here but I didn’t need to go at that point… typical. I set out from the Aid Station just behind Karl and his pacer and tagged along for a mile or so before I stopped briefly to change the battery in the camera. Karl was kind enough to see I had stopped ahead and turned to check I was ok and I waved him on. The frequent battery changes at least meant I was well practiced with the clips on my Inov8 race vest (bloody fiddly). Despite that issue, I really like the race vest. 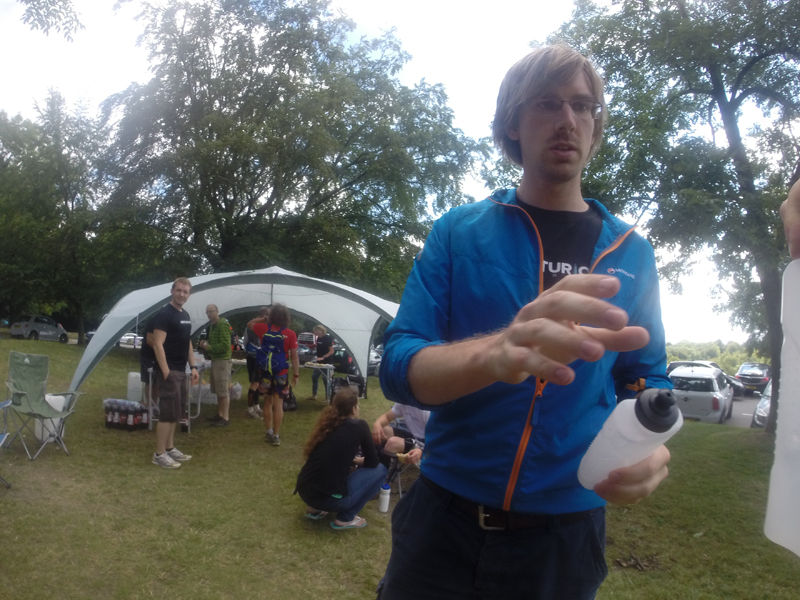 How the hell do I unclip the Inov8 Race Vest? As I headed towards Otford I bumped into Stuart Mills who was on a training run the other way before I took my second minor detour of the day. 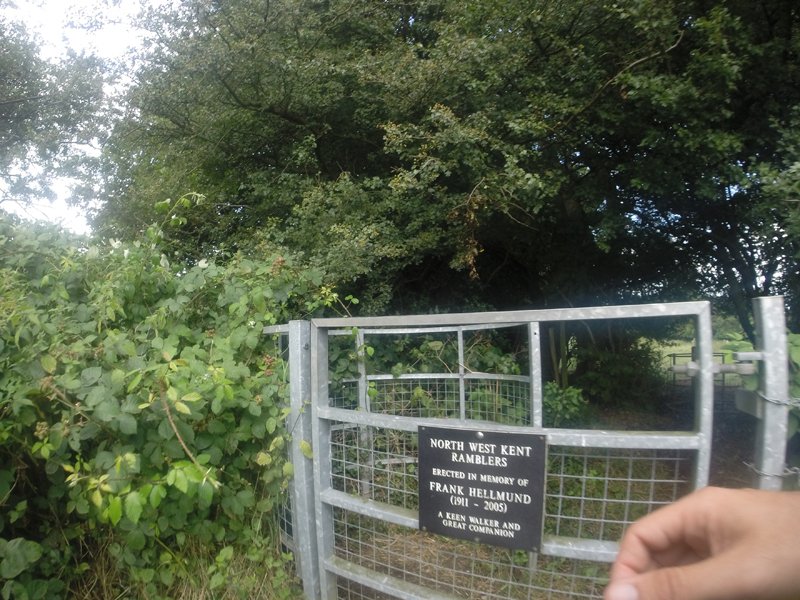 There was a right hand turn into a small lane which followed the North Downs Way next to a Best Western Hotel which I missed and overshot by a few hundred yards before realisng my mistake. When I back-tracked my route the marking was partially obscured so it was an easy one to miss. Back on track I headed through Otford and towards the next checkpoint. There was another steep section which I marched up. Keith Godden had kindly volunteered to meet me at a few points and run a few miles as he builds his mileage up from injury and he texted me to say he was at the 60 mile checkpoint and was going to walk back towards me. 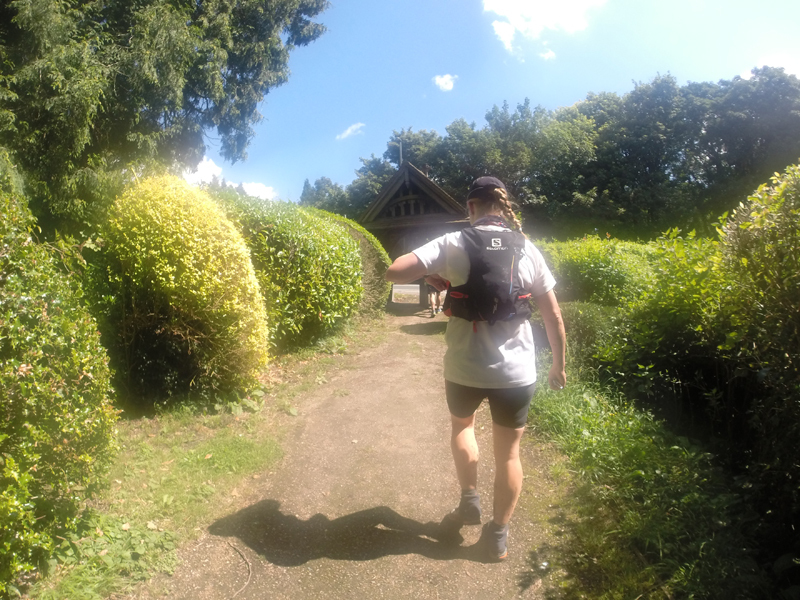 I continued on through more gates, stiles and fields until I bumped into Keith and we ran/walked along some nice longer stretches to the next Aid Station at Wrotham 60 miles into the race. My stomach wasn’t feeling too great but it was more of an ache than sickness. I bumped into Mimi Anderson at the next Aid Station who was crewing for Fiona McNelis and we chatted briefly as I grabbed some fruit and sat down for a few minutes. I think this was the point when I really started to ease off mentally. Keith walked on with me for a couple of miles before turning round and heading back to collect his car and drive ahead to our next planned meeting point. It was a very pleasant evening as I continued along some country lanes seeing the occasional runner or two. I continued on as the sun gave way to clouded skies, paused briefly for another battery change on the camera and marched on. I had slipped into marching mode and wasn’t really making any effort to run. Sure my calf (and quads) were a little sore but I probably could have mustered a run. I asked myself that question a few times but to be honest the negative part of my mind just didn’t fancy a run and I marched on. 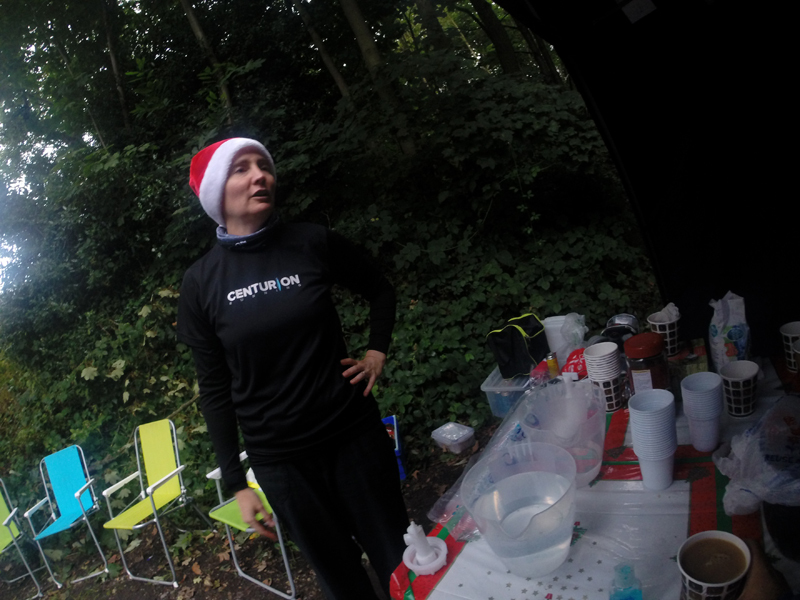 I got to the 65 mile Xmas themed Aid Station where Louise Ayling kindly offered me some of her stash of chocolate treats and once again I hung around for several minutes at the Aid Station. My stomach was feeling something which I think was hunger so I munched my way through a large handful of biscuits before heading out. Dave Bayley passed me at this point and was looking in good form at the time. I headed out at a walk along the route for a few miles as the sky turned a little gloomy with more cloud cover and some of the tree covered areas got a little darker. Unfortunately it was no more than a few miles before I needed another toilet stop. My supply of wet wipes were running dangerously low and I had been forced to move from the 3-4 wipe luxury to a 2 wipe minimum strategy to ration my supply. Fortunately for me a little further ahead I bumped into a pacer who was walking back along the course to meet his runner and after a brief chat he gave me some extra tissues to add to my dwindling supply. My hero. The tissue man. It got dark fairly quickly although I refrained from using my head torch immediately after stumbling over one or twice then I put it on. I marched on towards Rochester and over a high long bridge before I met Keith again and we marched on to Aid Station 10 at Bluebell Hill about 76 miles into the race at around 10.30pm. Drew Sheffield was at the Aid Station and started to encourage me to leave by casually asking why I was still hanging around the Aid Station just as I started sipping my cup of tea. I don’t think I ate anything here as I was concerned about having another unscheduled stop again and after a few minutes Keith and I headed out. Keith accompanied me for a couple of miles before heading back to his car and getting some sleep as he was going to meet me again at the end. Keith had relayed to me that Wendy had been going quite well and was lead lady for a while although the 2nd place lady was also looking quite strong. After Keith left me I trudged on towards Detling where I had crewed the previous year. The section after Detling was described as a “pretty grotty section” with lots of ups and downs and difficult ground so something to look forward to. I had my lowest mental point on this leg. I was slipping outside a 24 hour time, tried to convince myself to make an effort, but I didn’t fancy it and I mentally resigned myself to walking it in. I had several discussions with myself (in my head) but nothing could spur me out of this slump. I even got to a point where I convinced myself that I wasn’t going to accept the finishers medal as I didn’t make enough of an effort and then five minutes later realised this was a childish thought. I really was in a black hole. I continued to march on in the dark largely by myself until I recognised the Detling Aid Station and headed inside and had some soup and bread and a sit down where Drew Sheffield seemed to be following me around. I chatted with the guys and Peter Foxall who was also here. I recall James asking Peter of he could make sub 24, to which he replied positively to giving it a go and to which I admitted defeat. I wasn’t even going to try, it doesn’t feel great having to admit I wasn’t prepared to try. I spent a good 10-15 minutes there enjoying a sit down and chat before I wearily went on my way. James Elson had turned up and warned people that the rain was coming in 15 minutes. 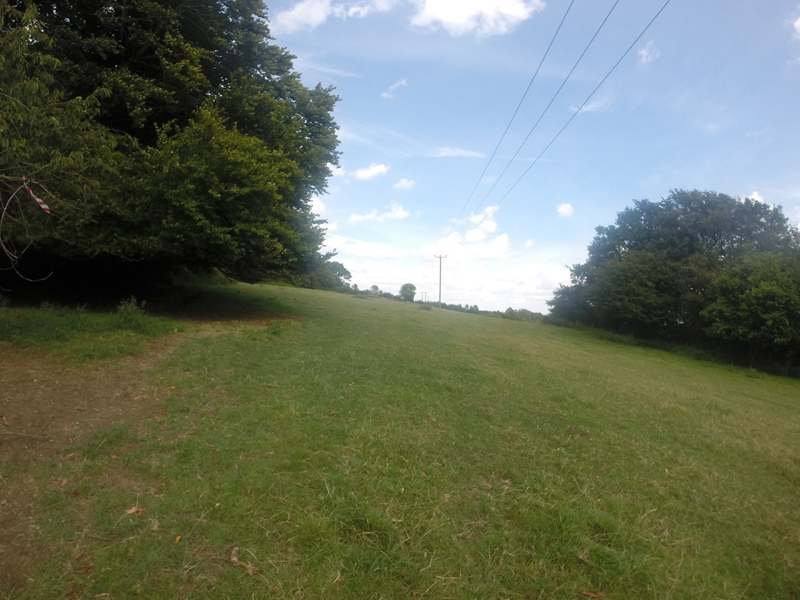 I trudged on along a pretty undulating section after Detling. It was probably the loose rocks, stones and narrow paths which made this section more difficult as with the sleepiness now kicking in I found myself stumbling over a few times. True to James’ word, the rain started around 1am ish and I immediately put my rain jacket on at the first sign. I didn’t want to risk getting my body soaked during the night and wrapped up. The rain progressively got heavier and heavier until heavy sheets of rain were falling. With my head torch on the occasional sheet of rain would reflect back at me giving the impression of distant flashes of lightning. I was trudging along by myself in the middle of the night in awful weather conditions and I tried to convince myself that I sometimes perversely enjoy these conditions and now is the time to break into a run but the other part of my consciousness was not having any of it and laughed back in my face and so I trudged on. This section wasn’t that much fun, the rain was so heavy that at one point I had difficulty spotting the markers and glow-sticks and followed the line of direction on my Garmin. The battery on the GoPro died although I didn’t want to risk getting the camera wet and decided not to change the battery. It was pitch black anyway so you weren’t missing much at all. 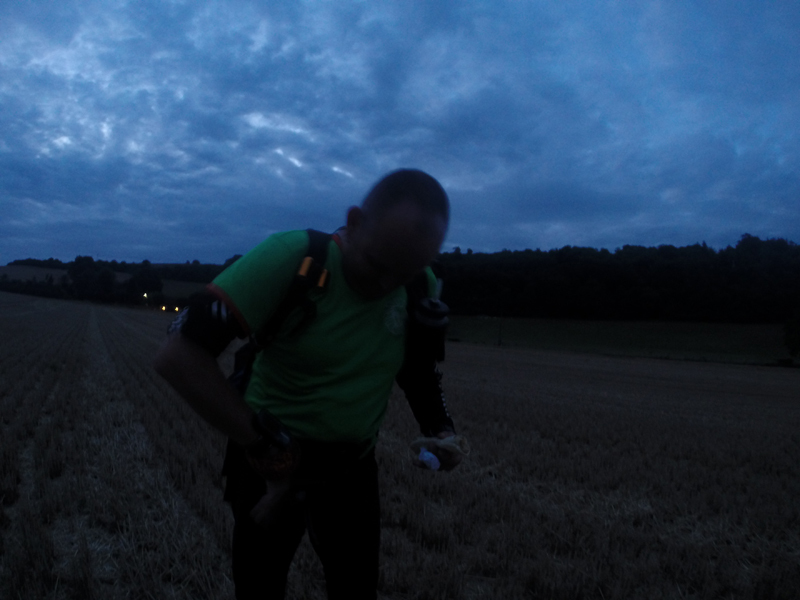 I carried on walking through the night for the next few hours until I got to the Lenham Aid Station. My legs were pretty stiff and sore by name with the constant up and downs although my feet didn’t feel as battered as normal which may be down to the cushioning of the Inov8 Race Ultra 290’s as I was giving them their first serious outing. It rained for the next few hours as I made my way to the Lenham Aid Station. As I stopped there I could feel myself starting to shiver and had a couple of cups of tea to warm up before moving on after a few minutes. One of the many excellent volunteers kindly opened the camera case for me to change the battery as my hands were too wet and cold. It started to get a little lighter around 5am and the rain eased off as daylight set in. I had a text from Keith to say he was heading towards me. Keith was waiting for me at the Dunn Street Aid Station and I also bumped into Peter Johnson here and. As I left Dave Bayley walked in with a line of dried blood running down his nose. I checked if he was ok and he mentioned something about cutting his head on a branch. He unsurprisingly seemed a little tired but ok and I carried on as he went into the Aid Station. This was one of the few Aid Stations where I didn’t stop, I hadn’t been eating or drinking a lot during the night and didn’t need to re-supply and by now I was now looking forward to just getting this over with. I was gutted to hear Wendy had dropped with hypothermia at the 99 mile point whilst in a strong position particularly as she was cruising around earlier when we ran together and was looking strong. Things can change quite quickly in a race when conditions deteriorate. Unfortunately I couldn’t use that as an excuse today. 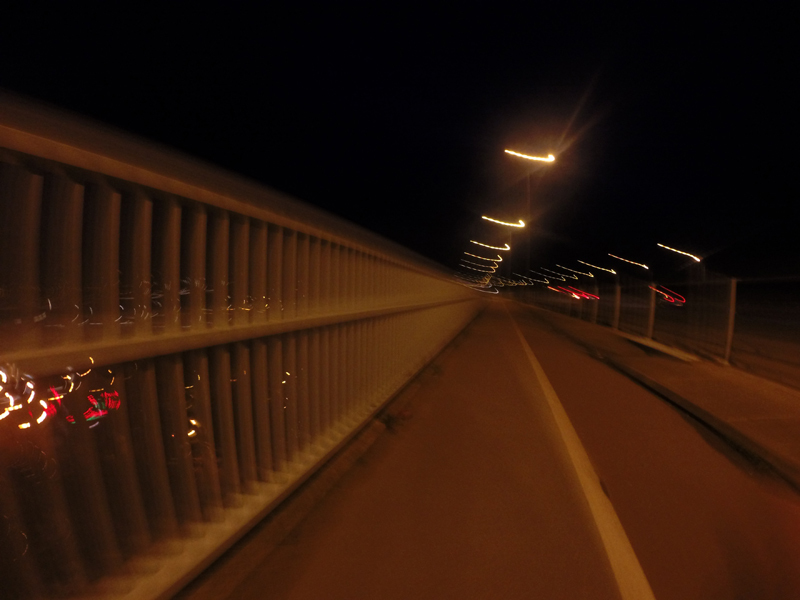 The conditions were challenging during the night but I had given up way before then. I was grateful for Keith’s company and we chatted and walked the last four miles to the finish along with another chap (Doug I think). We followed the now much flatter paths, fields and tracks into Wye which marked the end of the route. I dawdled into the finish to be greeted by James Adams, Stuart March and Karen Webber with one or two others who did their best to cheer the finish but I just wasn’t into it. It was a disappointing effort and I didn’t really want any fuss as it wasn’t deserved. The finish. It was lovely and sunny last year.. when I didn’t run it. After chatting the to guys briefly, I headed into the finish area got changed and had a nice bacon sandwich and cup of tea before thanking a few guys and then headed home. The final finish time was just over 25 hours. I could try and put some gloss over it by talking about the lack of my normal preparation, the calf injury (genuine but not completely debilitating) and the stomach problems (required several unscheduled stops but didn’t prevent me from running) or the horrible weather conditions overnight (I should be well used to the rain by now) but truth be told, I gave up half way around the course and marched it in and that was really disappointing. For me, it’s about my own personal standard (accepting there are both quicker and slower runners and I’m not comparing myself to anyone but myself) and having had a couple of half decent runs at the TP100 & SDW100 by actually making an effort and running the second half of the race when the legs and mind were tired, this time I slipped into an old bad habit of taking the easy option and walking it in. I even recognised this and asked myself the question several times but couldn’t muster up any positive answer. I hope this report didn’t come across as a hard luck story, it’s not, the result was down to my own lack of effort. I approached this race with a slight injury and the motto “better to have tried and failed than not tried at all” but I was guilty of “failing to try” during the second half of the race. Despite a few kind words from several people after the race, I’m disappointed with my own lack of effort and I will just have to try and remember this experience when I’m faced with a similar situation in the future. You have good days, bad days and indifferent days and it would have been easier to stomach if I had tried and had a bad day. Not trying doesn’t sit well with me to be honest. 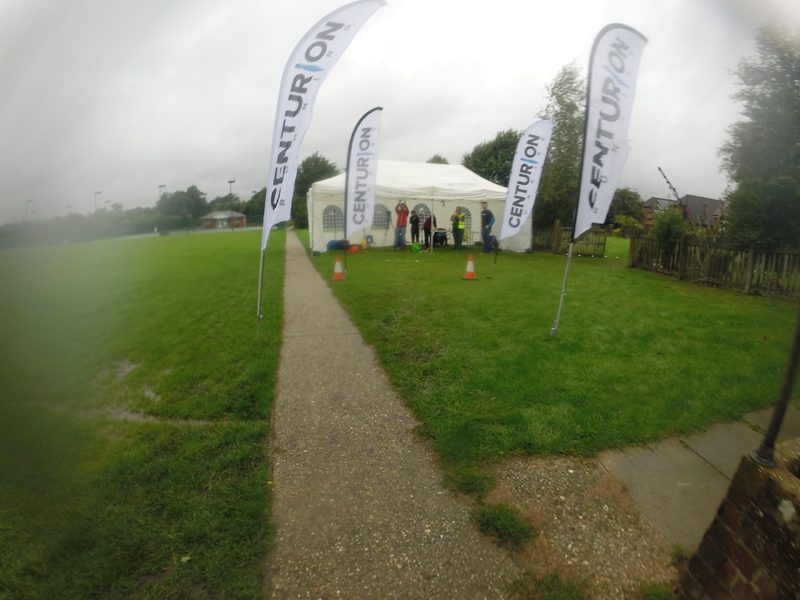 Thanks to the Centurion Team for another well organised event in challenging conditions. I didn’t hear of any complaints from people at all and the Aid Station volunteers some of who I know and others I hadn’t met before were all excellent in their support of the runners. A big thank you to Keith for coming out to meet me, listening to me moaning and having to take on the role of the walking pacer and then giving me a lift home as I slept in his car. The story of my year so far has been good run (TP100) followed by a not so good run (GUCR) followed by a good run (SDW100) followed by a not so good run (NDW100). With the T184 in 2 weeks time, there’s no training I can put in place before then and the focus will be on rest as the calf is still a little sore a couple of days later when my other muscles are recovering. (I still can’t quite do a calf raise without feeling it). However, as this is a long (184 miles hence the name) self supported race it was always planned as a long fun run (read glorified hike) due to the proximity of the NDW100 so the aim is just to finish. This will then give me 6 weeks to put in some better training for the Winter 100. Since the start of the TP100 in May, I haven’t put in solid training weeks for 3 months with a continuous cycle of rest, race and taper and so it will be good to have a few weeks after the T184 to refocus on the Winter 100 finish the Grand Slam and finish the year on a high. Knowing my luck at Centurion events, there will be flooding, diversions and biblical storms and tempests at the event. Oh, I can even revisit the places I threw up at (twice) during the Winter 100 in 2012. It’s going to be something to look forward to! The good news is that the Grand Slam is still on which was a bit of a risk before the start of the race. After mentioning my personal challenge of trying to better a combined time of 83.5 hours, this result has now made that out of reach (I would need to better my 100 mile TP100 PB time by an hour to achieve it). We still have 17 people left in the Grand Slam with Dave Ross holding a commanding lead after another awesome run followed by Jeremy Isaac, Warwick Gooch and then Peter Bowles who had a good NDW result after not feeling great earlier on in the race. James Adams kindly summed up my memory of the race with a well done for “Not DNF’ing” and that’s about the only solace I can take from this race. Thank you for enjoying my misery. Great report Paul. Interesting soul searching. Great to finish even in a ‘sub optimal’ mental state – that’s perseverance! Got to be worth seeing a sports Physio on that calf? Thanks for the interesting account, good to read a different sort of race report! You’ve set high standards for yourself; I hope they don’t work against you at T184. Looking forward to seeing the GoPro footage too. I have been many things to many people but “My hero. The tissue man” is a new one to me. Well done, a great result in very difficult conditions. Was wondering what garmin u use?..I’m visually impaired..so I’m a bit reluctant to navigate. Thank you for this inspiring story. Did you use Suunto or Garmin? How did you charge your watch during the race? Did you use gels? 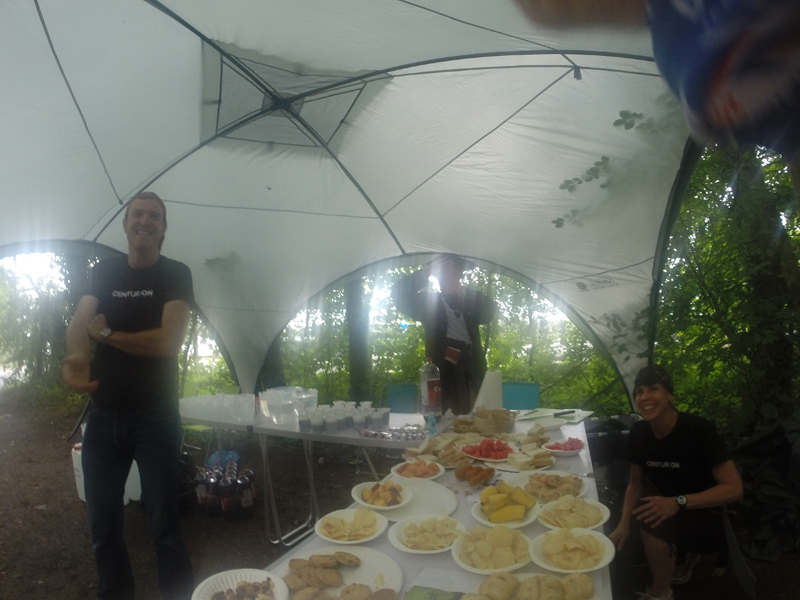 Did organisers offer gels and protein bars at aid stations? How much water did you bring with you? Did you mix up some drinks? Interested to run this race. Thank you once more. Hello, thanks for the comment. In answer to your questions.. Garmin, Portable Charger, No.. don’t think so, plenty of food and gels at aid stations, there’s a minimum 1lr requirement to be carried, probably didn’t use energy powders at the time but use tailwind now. Centurion races are well recommended so I’m sure you will enjoy the experience.